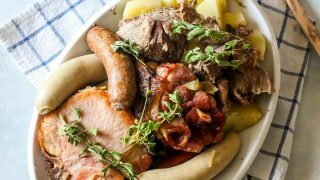 How to make Alsace Choucroute Garnie (Braised Pork Meat Pot) with sauerkraut and potatoes – the famous meaty, delicious dish from Strasbourg France. Over Christmas break, we decided to scale back our family’s Christmas gift giving, and instead give ourselves a fantastic experience – we headed to my brother and sister in law’s sleepy cottage town outside Heidelberg, Germany for a week to tour the German countryside and be with them for the holiday. It was a magical week – and full of so many great memories I hope my kids will cherish for a long time. 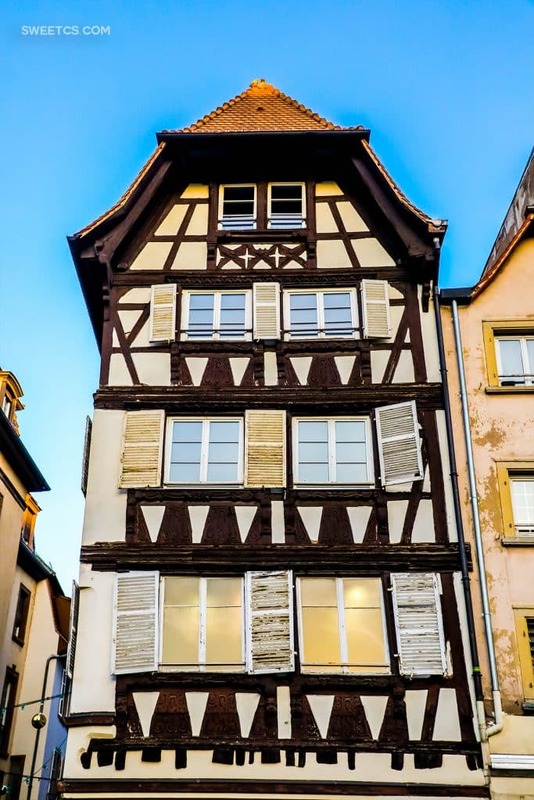 One of the day trips we took while there was to the utterly charming Alsatian town of Strasbourg in France – just over the border from Germany and a short drive from Weinheim. 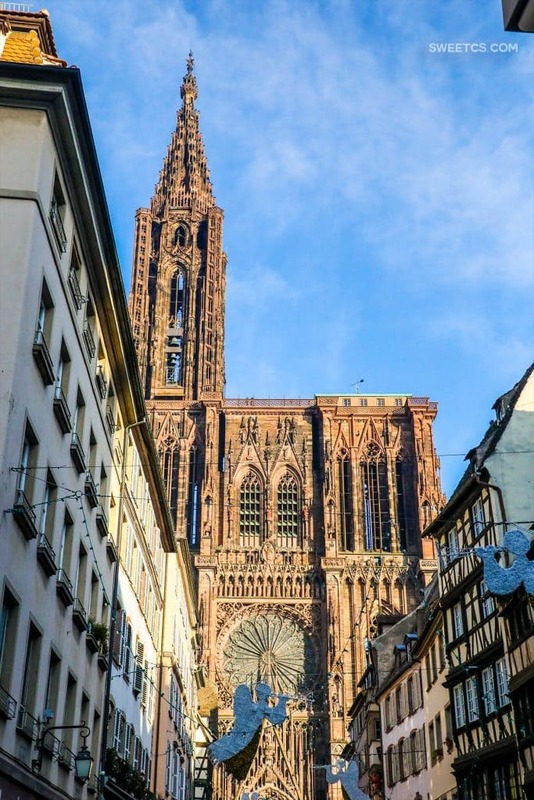 Strasbourg, and the entire Alsatian region, straddles an area that was fought over often in history – and at times belonged to France, Germany, back and forth. 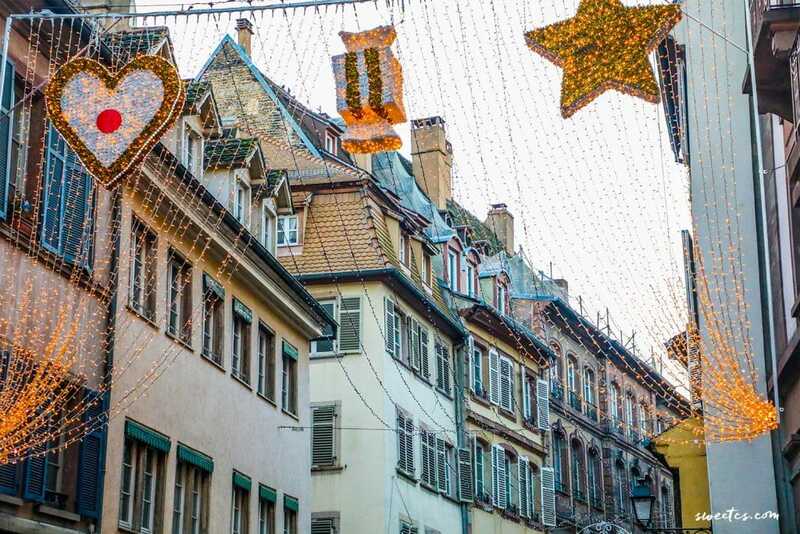 Strasbourg is like many border cities that take on two country’s cultures, but Strasbourg, and all of Alsace, somehow feels even more different and magical. We sadly didn’t get to spend nearly enough time in Strasbourg – we only went for a day while visiting my brother and sister in their lovely cottage town outside Heidelberg (which is conveniently only about an hour and a half from Strasbourg). We really wanted to visit while the Christmas market was still up, but we came a short two days after it was shuttered for the season (just a few days after Christmas), which was sad – but as so many of the Christmas decorations still twinkled above the city, it was completely magical and straight out of a fairytale. 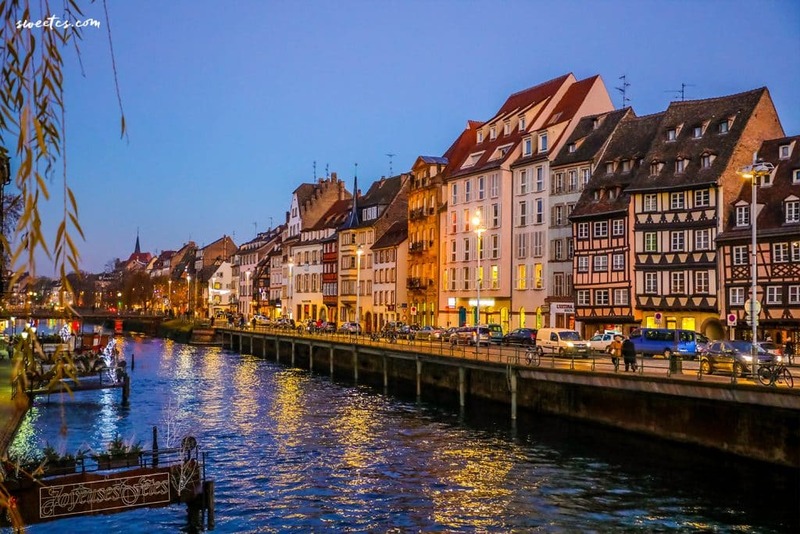 My kids LOVED Strasbourg – the ginger-bread like houses, winding streets, and large beautiful town square – plus the glittering canals, which were so much fun for two little kids from northern Colorado to explore. While I could go on for days and days about how lovely the town itself was, the real standout in Strasbourg is definitely the food. 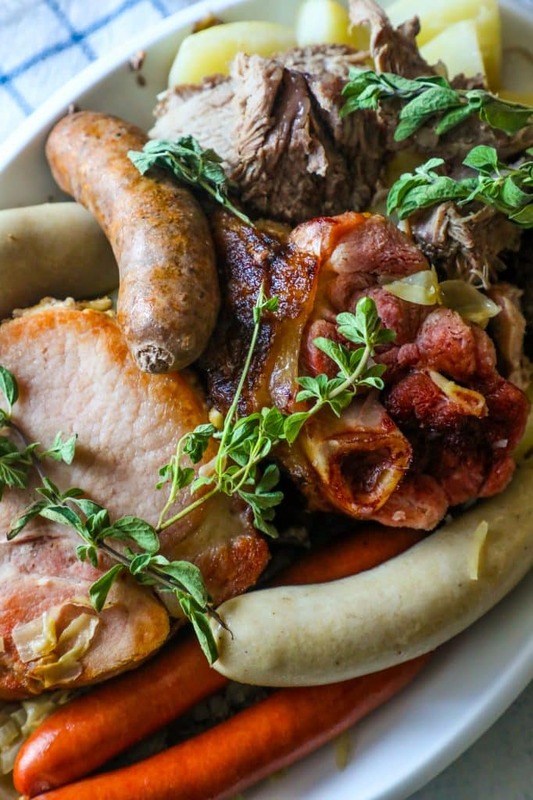 From light wine sauces to hearty platters of meat – the regional specialties from Alsace combine the best of French and German cooking – and this braised pork pot is no different. 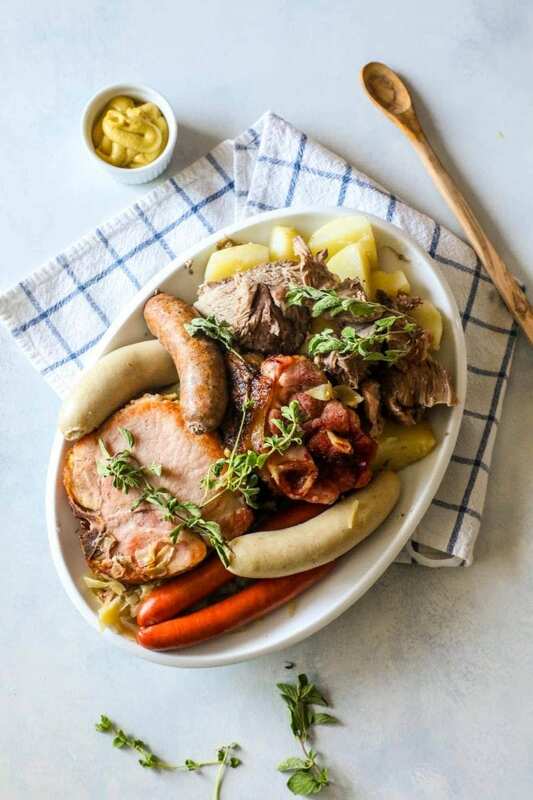 The sheer amount of meat, plus the addition of sauerkraut make it uniquely German – while the slow cooked pot, slowly simmered in white wine, invoke a classic French method. This dish is a fantastic show-stopper for a dinner party (or, if you’re trying to impress your friends and family like my husband, you could make it for the Superbowl…) but is actually quite simple to prepare. This is the perfect way to feed a crowd – with style – and celebrate the best of French and German wine and beer. Pour a glass and get your dutch oven ready – because this is a recipe you don’t want to miss! Generously season pork loin and shoulder all over with salt and pepper. If you’re more prepared than I am, you should season these cuts a day or two ahead of time and let them rest on a cooling rake on a baking sheet. Preheat oven to 250°F. In a large Dutch oven, heat your 1/4 cup of fat (lard, goose/duck fat or oil). Add onions and cook, stirring often, until softened but not browned, about 10 minutes (this is called “sweating”). Season your onions early in the process with salt. They’re release some of their water which you’ll want to cook off. To your sweated onions, add wine, stock, and cheesecloth. Then add pork shoulder, slab bacon, and ham hock and bring to a simmer over medium-high heat. Cut a parchment paper lid sized to fit Dutch oven and set directly on top of meats and liquid. Transfer to oven and cook for 1.5 hours. 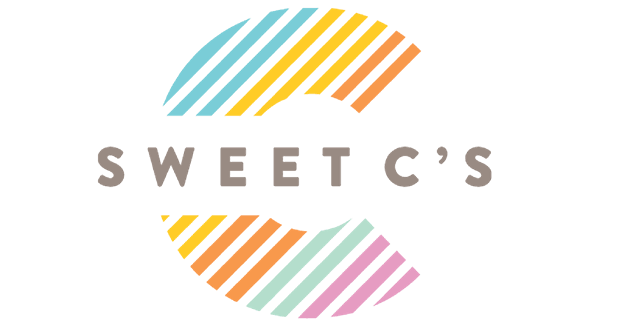 While the shoulder braises in your Dutch oven, put your seasoned pork loin in a small skillet or baking sheet and cook on a separate rack in oven about 1 hour. You’re shooting for an internal temp of 120o- 130o. Next you’ll prep the sauerkraut. In a colander, lightly rinse sauerkraut under cold running water, then taste. If you want less of a “sauer” taste, rinse thoroughly, until you reach the desired taste. I used good quality uncooked ‘kraut from my local hippie market. My wife, of occasionally questionable pallet, doesn’t like sauerkraut, so I really rinsed mine. In hindsight, I would have preferred more of the sauerkraut flavor to compliment the wine in the braising liquid. Once you’ve reached your desired tartness, squeeze all liquid from the ‘kraut. After meats in Dutch oven have cooked for 1 1/2 hours (#3), add sauerkraut to Dutch oven, mixing thoroughly. Increase temperature to 315°F re-cover and cook until meats are very tender, about 1-1.5 hour longer. When the meat in the Dutch oven is nearly cooked, braise your sausages with 1 cup of wine and water to fill your pot to ½ full. Simmer sausage until cooked through, about 10 minutes for raw meat, 5 minutes for fully cooked sausage. In a cast iron skillet, sear your pork loin in oil or fat turning often, until well browned on all sides. Slice when finished. Add sliced pork loin, smoked pork chops, and cooked potatoes to Dutch oven. Allow everything to heat through in the Dutch over for 10-20 minutes. To serve, remove all meats from Dutch oven and set aside (best on a warmed baking sheet). Season sauerkraut with salt and pepper to taste. Arranging sauerkraut and potatoes on a platter. I recommend using tongs or a slotted spoon to allow you drain off excess braising liquid. Arrange meats and sausages all over mound of sauerkraut and potatoes as artistically as possible. Serve with sausage, dry Reisling or good Pils lager.